The Church of St.Nicholas, Rotherfield Greys is situated approximately three miles west of Henley-on-Thames, in South Oxfordshire. It is thought that a church may have existed on the site as early as Saxon times, and records show that an existing church was enlarged in the 13th Century. What can be seen today is basically Norman - but much "improved" by the Victorians. Within the church is the spectacular early 17th century Knollys Chapel (pictured) containing the ornate tomb of the Knollys family. 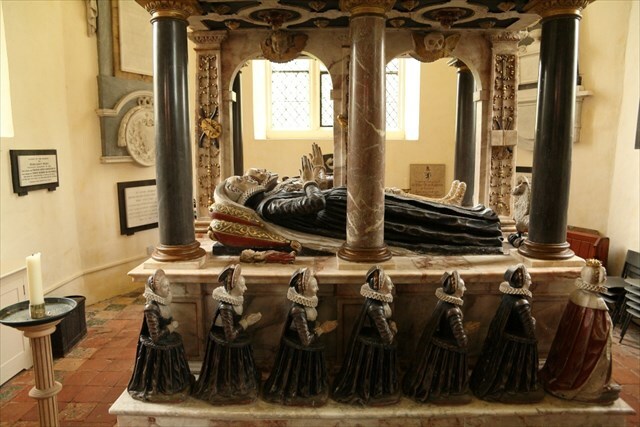 Above the tomb are effigies of Sir Francis Knollys and his wife Lady Katherine (Lady in Waiting to Queen Elizabeth I). Around the sides are the kneeling effigies of their fourteen children. The chapel was added in 1605 by their second son William Knollys, first Earl of Banbury and at that time the owner of nearby Greys Court. Lady Katherine Knollys was the niece of Ann Boleyn (second wife of Henry VIII). In front of the altar is a brass to Lord Robert de Grey of c.1387. Lord Robert was an earlier owner of Greys Court. Greys Court now belongs to the National Trust and is well worth a visit while you are in the area. The property is open year-round, but check the NT website for exact details. The listed coordinates are for the church porch within which there is a fine memorial bench. The dates for Richard Lockhart Ovey are: A6-06-1878 to 0B-0C-1946. Now move to WP2 where the dates for Horace Charles Pilcher are: D8-12-1845 to 19-05-19EF. Finally, move to WP3 where Sgt WAG Atkins' service number is 5G43H0.